Greatmats 1/2 inch thick interlocking foam play mats feature 4 puzzle mats in one pack. Use these foam play mats in the home or at school. Easily combine the play mats together in any room by simply pushing the tiles together as if you were assembling a puzzle. Each playmat pack comes with one puzzle tile of each of the following colors: red, green, yellow, blue. Use this kids soft flooring for kids play areas and kids recreation rooms. Each pack offers 4 fun colors to mix and match to create a unique fun design for your children’s safe and soft flooring surface. These interlocking foam tiles are 12 mm thick and feature bright colors. The interlocking tiles are cut with precision and feature a very tight fitting interlocking design when assembled together without the need for adhesives. Each foam play mat is 2×2 feet in size and weighs just 1 pound. With a universal interlock design, these play tiles can be laid down in any direction, making installation as easy as can be. Just push the tiles together and you are ready to go. Clean play mats regularly with a vacuum after testing to make sure the vacuum does not damage the mats. Have your vacuum cleaner set at highest setting or just use hose and nozzle. Don’t use a power head. You may also clean the mats with a damp mop as needed using basic household soap and hot water. Spot clean with a scrubby and a sponge. Ready to be surprised? According to the NCIPC, falls are responsible for more fatalities each year than motor vehicle accidents and more than half of all falls occur in the home. The good news is that with a few simple precautions, you can make your home much safer. Go through your house and seek out any tripping hazards especially near stairs and windows. Be sure your throw rugs and other “slidy” objects don’t pose a risk. Then, take a look at your flooring, especially in areas where running and horseplay happens the most. Introducing the Economy Foam Puzzle Mat. It is a 1/2 inch interlocking foam flooring that’s great for almost any room in the house. Lightweight and portable, it can be installed directly on any hard surface and requires no adhesive. So easy to install, you can transform your hardwood, ceramic, or concrete floor into a softer safer play area in minutes. 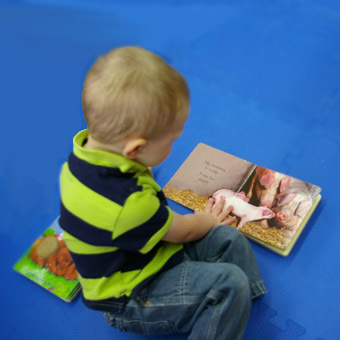 These interlocking foam mats are great for kids rooms and recreation rooms. They are tough enough to use in residential or commercial applications. You can even use them in basements or garages. Economy Foam Puzzle Mats are lead and latex free. They feature a non-slip surface area that provides excellent traction as well as a soft landing surface. They are so durable they can be used for dog agility training or even parachute staging areas. They are waterproof and easy to clean. These foam mats are also odor free so you don’t have to worry about having them in bedrooms or other areas where you plan to spend a great deal of time. Each foam puzzle mat measures 2’ x 2’ and is 1/2” thick. They provide fatigue relief so you can use them in areas where you will be doing a large amount of standing. Have a big dinner planned where you’ll be on your feet in the kitchen all day? No problem. Piece the mats together in your kitchen floor until the job is done. Then, simply stack them and move them to another room or a closet for easy storage. 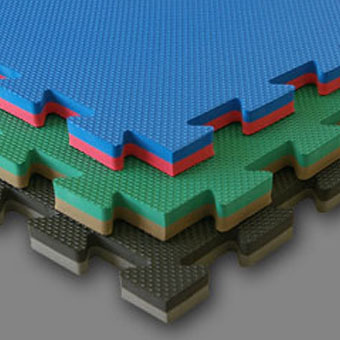 Should you decide these mats aren’t perfect for your particular need, we encourage you to browse our complete line of interlocking foam mats. We have a number of different sizes and thicknesses with some starting as low as 99 cents per square foot.